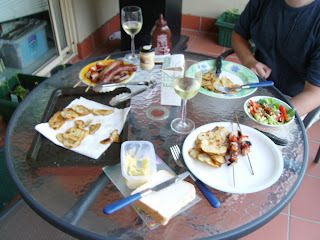 Hm, now this is a food and book blog, so it's not the forum for me to discuss my opinions on Australia Day. However I feel that I have to clarify that this was not an 'Australia Day BBQ', rather a BBQ that happened to be held on that day, which was significant and worth naming in order to set the tone - that long weekend vibe that often gives rise to urges to grill. Spectacular weather along with excellent, fresh, well-priced food seemed as good a thing as any about Australia to celebrate. But to the food. For me, when it comes to barbecueing, I concur that meat is an essential, and that it can be provided from a range of animals and in a range of colours and formations, however what I consider a given on any barbie where I'll be holding the tongs is potatoes. Very finely sliced, liberally oiled and with generous amounts of sea salt and rosemary distributed atop. They're normally my BBQ vegetable staple, but since we were going all out, I even prepared a wee salad, of spinach, red capsicum, snow peas, avocado and cashews. Something had to balance out the three types of meat! The grill hosted chicken skewers with mushroom and capsicum, beef sausages, and tres skinny BBQ steaks, which took about as long to cook as it did to devour the potatoes! Served up with a glass of Polish Hill Riesling from Randalls, bread baked that morning, and with Laharum Grove aioli as condiment of choice (it went with everything), it had me wondering momentarily why we ever cook any other way!